I am not easily duped by gimmicky sales pitches. I don’t believe for a minute that I can rocket my abs from flab to fab in five minutes a day (or eight hours a day, for that matter). I do not buy anything sold with the words “instant” or “miracle” or “magic.” I do not believe I can make $7000 a day selling real estate in my spare time. But the promise of bread in five minutes a day was too hard to resist. So, when I saw Artisan Bread in Five Minutes a Day (subtitled: The discovery that revolutionizes home baking), I leapt off the turnip truck and bought a copy (at full price: $30.95). No infomercial required. As I write, I have made three batches (of four loaves each) of boule (round bread) from what the authors, Jeff Hertzberg and Zoe Francois, call “the master recipe” and I have to say, it’s pretty good; a hard, chewy crust and a moist, solid, but not too dense, crumb that tastes more like sourdough the longer the dough ages (more on that later). It’s certainly not the best “artisan” bread I have ever had, but then again, I am not an artisan who has spent years learning the art of bread making. I have also never had much confidence baking bread and the little moment of triumph I feel when I pull one of these simple loaves out of the oven has made me want to do much more. 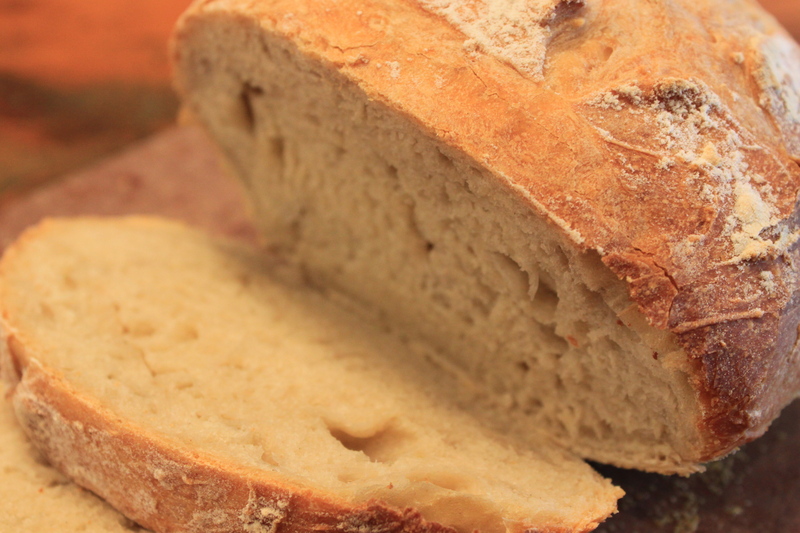 Artisan Bread tells you how to make dozens of different breads built from one very simple master recipe, which takes about 10 minutes active time to make. After resting, the dough goes into the fridge where it lasts up to two weeks, taking on more of a sourdough flavour as it ages. When you want to make a loaf you simply pull off a grapefruit-size chunk of dough, let it rest at room temperature for 40 minutes and bake it on a pizza stone for about half an hour. In a large, warmed, mixing bowl (a stand mixer or large food processor with a dough hook is perfect) dissolve the yeast in warm water. Add all the flour all at once and mix with a wooden spoon or on low speed until all the flour has been incorporated. The dough will be very moist and sticky but no kneading is required. Cover the dough with a loose-fitting lid or a tea towel and let rise in a warm spot for two hours (room temperature is fine), then refrigerate in a covered container (don’t seal it tight) for at least three hours. The dough will last up to two weeks in the fridge. 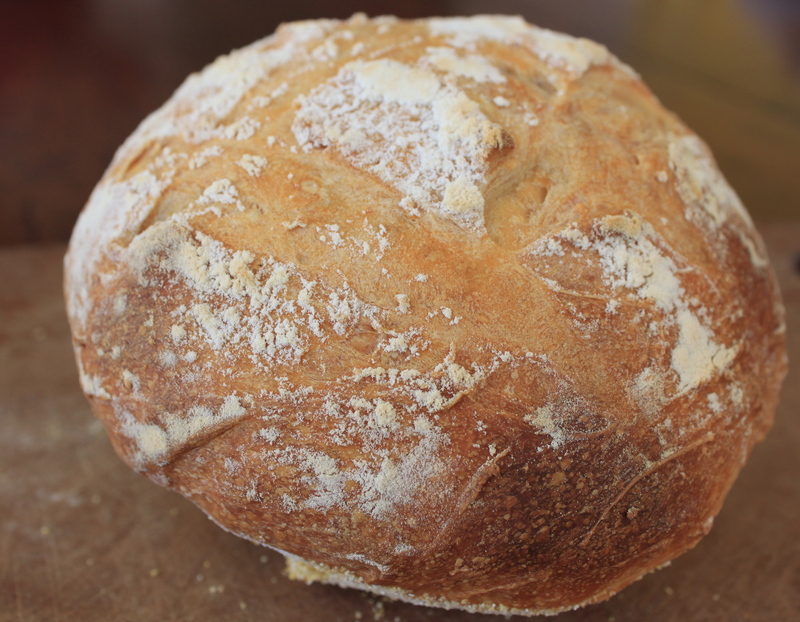 To make a loaf, sprinkle the surface of the dough with a little flour and cut off a quarter of the dough (about a pound), sprinkle on a bit more flour so it’s not too sticky and work it with your hands for about a minute (turning it and stretching it while folding the dough under itself) to form a loaf. Let the dough rest on a pizza peel or cutting board sprinkled with a little cornmeal. Let it rise for 40 minutes (you may not notice much rising, especially with older dough, but that’s OK). After 20 minutes place the pizza stone in the middle rack of the oven and preheat it to 450 F. Place an empty roasting pan on the lower rack. After 40 minutes dust the surface of the dough with a little more flour and slice three grooves in the surface with a knife. Slide the dough on to the stone (the cornmeal helps a lot) and immediately pour a cup or so of hot tap water into the roasting pan. Close the oven quickly so the steam doesn’t escape. Bake for 30 minutes or so until the crust is golden brown. Cool on a rack and enjoy.